The First Airlines waiting area is immaculately white—white walls, white counter, white curved entryway. Looming over the low white couch is a single blue monitor. It’s a familiar “Flight Departures” display, listing about a dozen upcoming flights. After a few seconds, the lines spin around in imitation of an analog train station notice board, like the one still hanging in Grand Central in New York, and the language changes from English to Japanese. As your eyes are scrolling the departure times and boarding statuses, the sound of bustling people echoes chamber-like around you, filling in the space outside of your field of vision with a familiar scene: crowds and crowds of people scrambling through a massive airport terminal. An announcement booms in from overhead, calling passengers to their boarding gates. You instinctively look down at the boarding pass in your hand to check your flight number against the one coming across the loudspeakers. But your boarding pass is blank. You look up again and the high-ceilinged airport terminal dissolves, revealing a tiny lobby on the 8th floor of an Ikebukuro office building. This is how the VR trip begins at First Airlines. Literally, from the second you exit the narrow elevator hallway you’re engulfed in an immersive VR experience. VR technology has been taking off around the world lately, especially in tech-mecca Japan. Last year, the all-VR mini-amusement park “Shinjuku VR Zone” opened in Tokyo, filling two floors with more than a dozen immersive video games. The premise of most virtual reality is to totally cut off your real-life senses, engulfing them in a projection so consuming that your mind exits its immediate reality and enters a virtual world. 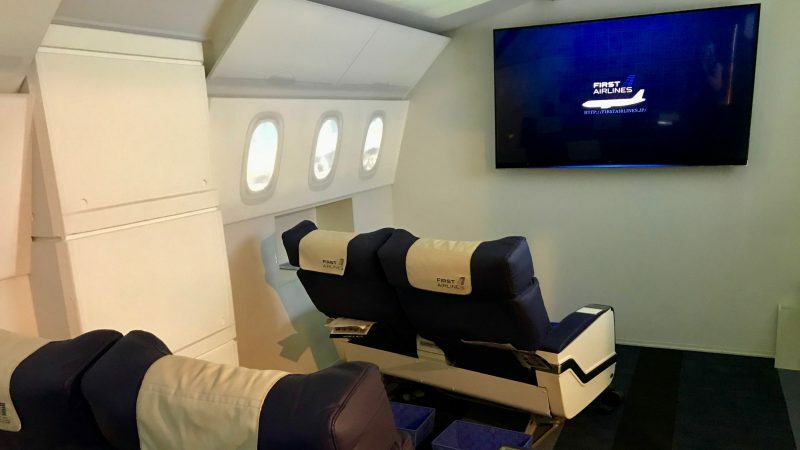 And while the flight VR at First Airlines does include the classic VR headset and 360-degree projections, this is only part of the experience. 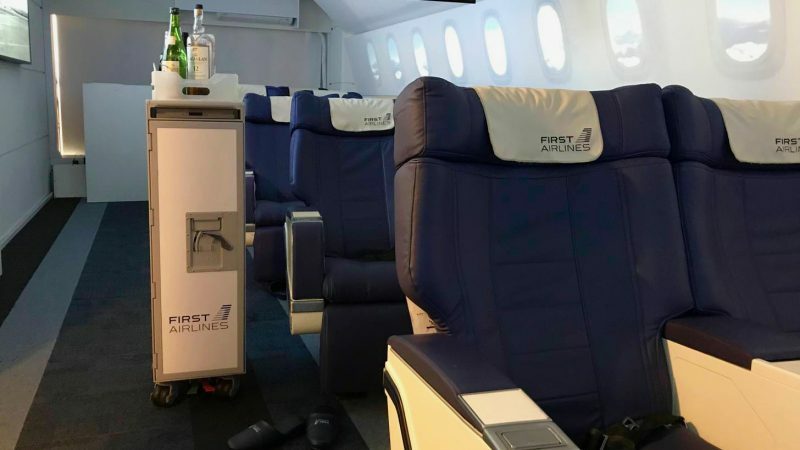 In this way, First Airlines introduces a very different approach to VR itself: rather than removing the mind from its real-life surroundings, the company uses and transforms the real-life surroundings as part of the VR experience. 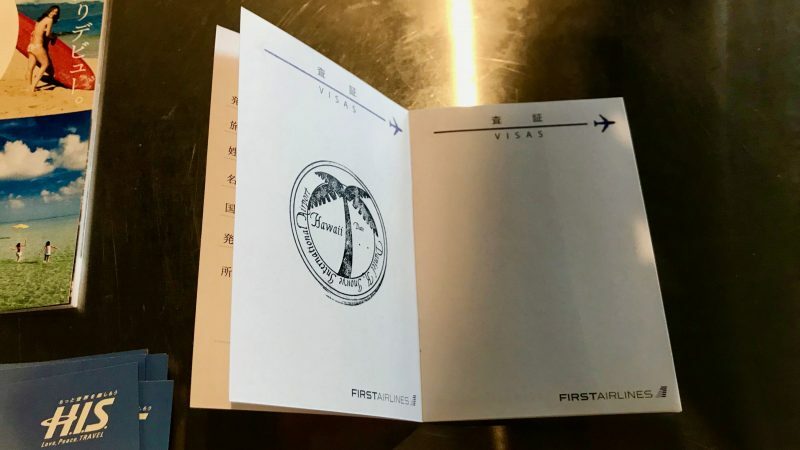 The lobby of First Airlines serves as the “boarding gate.” An airline staff member stands behind the counter and greets embarking passengers by handing out paper Japanese passports and imitation boarding passes. 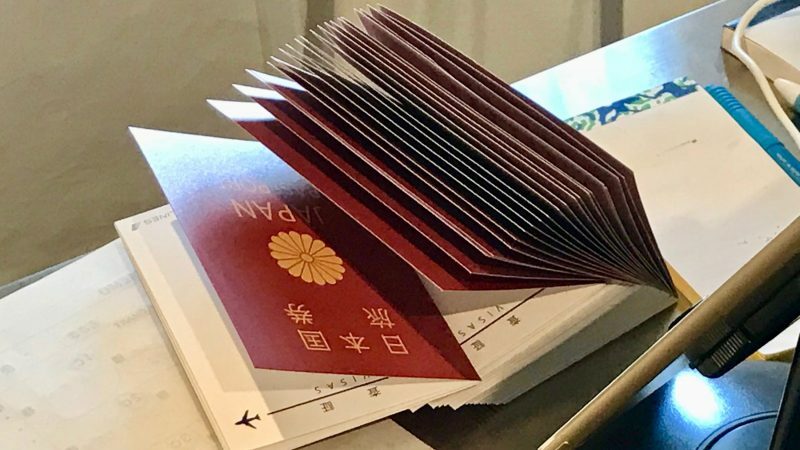 The passport booklet is stamped with the visa of your destination, and you’re invited to enter the “aircraft”—a room across the hallway. The plane is small—only six rows of two seats, lined up against a curved wall cut up with oval-shaped windows. The last two rows, with their lower-grade footrest and shorter reclining angle make up the “Business Class” seats, with the first four the “First Class” section (though standing in the doorway you can’t really notice the difference). The whole trip takes about 2.5 hours. You might notice that there’s a surprising amount of focus on the literal plane aspect of the experience. It’s almost like the act of riding an airplane—which, depending on the airline and trip duration, most passengers would probably rank from tolerable (Qatar, JAL) to miserable (United, Air China)—is being romanticized. Where would you like to (not) go? And yet it’s possible that this innovation wasn’t at the forefront of their mission when they crafted the idea two years ago. It was merely a consequence of something else: these people really, genuinely love riding on airplanes. At least the way this company has broken it down you can start to see the appeal—big lounge-y chairs, good food, all the free booze you could ask for, very cool in-flight entertainment, and ever-friendly flight attendants. 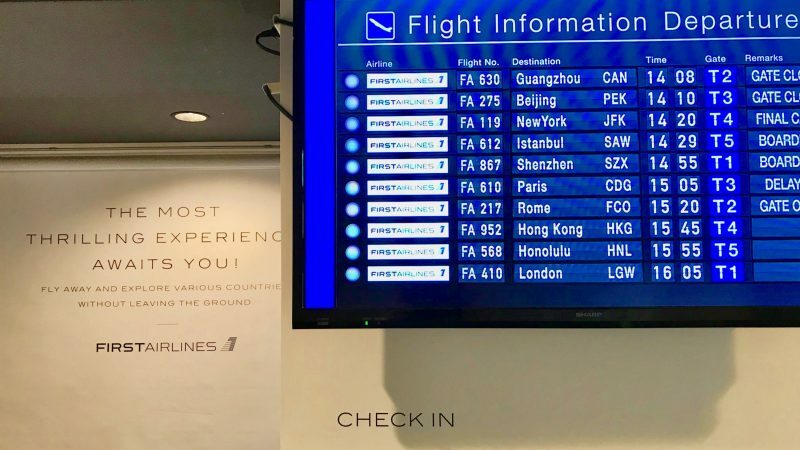 And they cleverly leave out the sore points—dry plane air, neighbors having loud and unremarkable conversations, delays, bathroom queues, passengers being forcibly removed while six or so onlookers record the assault on their iPhone cameras. You know, the usual. 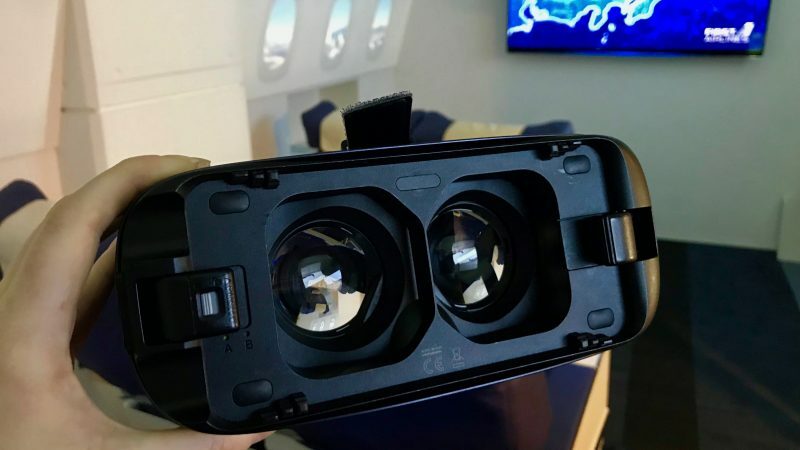 If it seems like First Airlines is indulging their fondness for airplanes at the expense of taking fuller advantage of VR technology itself, their newest project might reassure you. 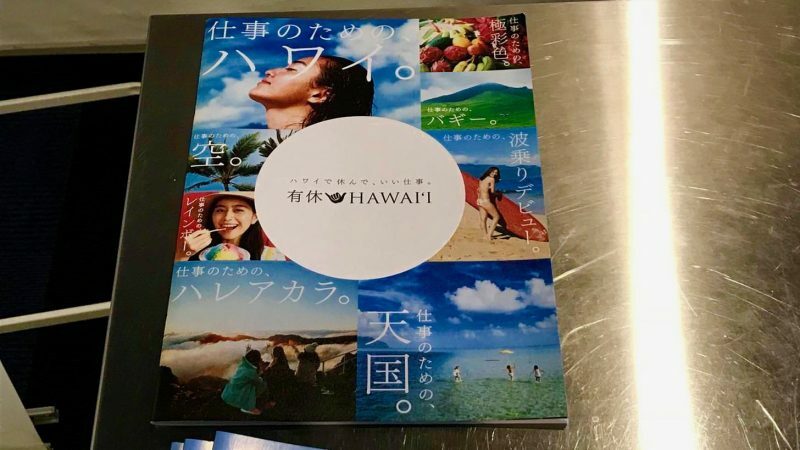 At the moment, they offer 5 destinations (New York, Rome, Paris, Hawaii, and Helsinki), with one destination for all “flights” selected per day. But they will soon be expanding their routes, opening new flights to the past. That’s right—starting May 17th First Airlines is experimenting with time-travel, with flights to old New York, London, ancient Angkor Wat, and more. Depending on the flight, you can witness Time Square circa 1945, the construction of the Empire State Building in 1930, Turkey circa 100 B.C., ancient Budapest, the construction of the Angkor Wat temples, or the great fire of London in 1666. And the in-flight meal will reflect the cuisine of the time. One way to look at First Airlines’ VR game is to realize that the food, booze and 15-minute VR city tour alone make the ¥5,980 fare (¥4,980 for “Business class”) well worth it. A role-playing game of the least-annoying air travel you’ll ever experience comes free.